Running a restaurant is believed to be one of the most difficult feats for a business owner. So, imagine managing two restaurants during turbulent economic times. This is story of Nick Sarillo, the owner of the popular Nick’s Pizza in suburban Chicago, and his experience trying to make it all work when his financial advisors suddenly tell him that it’s time to shut the doors. With this as a background, A Slice of the Pie takes a deep dive into building a business culture that is so clear and strong, that the infectious enthusiasm of Sarillo’s employees brings customers back again and again. Sarillo’s two restaurants gross six times the revenue of a comparable pizza restaurant, with an annual employee turnover rate of less than 20 percent. Sarillo decided to open his first family restaurant with experience more as a carpenter than a traditional business background. Sarillo’s father had previously run a pizza business, but his Dad was rather old-school with an assumed mistrust of employees and an inability to escape the constraints of a traditional top down management style. Sarillo the younger learns through his own early life experiences that employees respond better when their opinions are valued and they become part of the business’ planning and growth process. The development of Sarillo’s first restaurant focuses on creating a customer experience that is superior compared to any potential competitors, even when his father chides him for not building this restaurant on the cheap and for actually asking employees for their feedback. This feedback is the important factor in Sarillo’s tracking and rewarding metrics that allow employees to express their own personalities within the framework of a well understood (and followed) company purpose. Adding a second Nick’s Pizza location provides a good case study for business owners contemplating a similar move. It’s the well documented managerial systems and metrics that make this expansion happen successfully. Despite the rigors of managing two large family restaurants, Sarillo maintains the ability to step back and analyze his operation. This ability to “work on the business, not in the business” includes improving efficiencies, engaging in self-improvement, and for the most part, not micro-managing his people. Sarillo’s skilled balancing act isn’t always enough. His lack of financial understanding, the economic upheaval of 2008-09, and with plans for expansion already under way, Nick’s Pizza suddenly finds itself at the brink of bankruptcy. The summary of these events are the most compelling part of the book. Not many business owners would be as frank and forthcoming, but Sarillo bares his soul, describing his own shortcomings when he is forced to face the ultimate question – How can I save my company and the employees that have made it so special? The exact details of how Sarillo responds and defeats the odds is a secret that will only be revealed by reading A Slice of the Pie (hint: it has to do with an email). 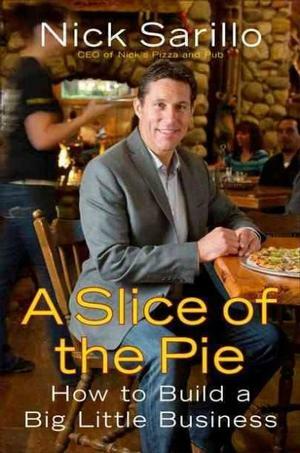 As you can guess, Nick’s Pizza survives, at least at the time of the book being published. Sarillo’s ability to endure has just as much to do with the management and culture shared by his employees as it does with the ability to build a business that the local community loves. That community support plays a large hand in saving Nick’s Pizza in its time of despair. A Slice of the Pie is an interesting read, although one has to wade through some later chapters that seem to be redundancies of ideas that were well explained earlier. It should be noted that the book’s foreword is written by Bo Burlingham, author of the bellwether book Small Giants. Forwards are usually gratuitous preambles, but Burlingham eloquently explains why Nick’s Pizza should be added the list of businesses that choose to be great rather than big. Chris Wendel is a consultant and lender with Northern Initiative in Traverse City. Northern Initiatives is a private, non-profit community development corporation that provides entrepreneurs with access to capital, technical assistance, information, and new markets. This entry was posted in A Slice of the Pie, book reviews. Bookmark the permalink. wow here we have it and inside information on how to run a local business. “It looks like more than a business story” . Just check it in amazon $12.99 for Kindle Edition and have great reviews. Thank for sharing.